FNND: When did you start painting and why? Clement Siatous: When I arrived in Mauritius I didn’t know that the Chagos Islands had been sold. I was 13 at that time and I was doing small drawings like all children do, and painting was not a serious thing for me. Then, between 1983-84, the British made a declaration that there were no indigenous people on Chagos and that no one had lived permanently on the island. It was at that point that I started painting in earnest, using my brushes to show that I come from Chagos, to shed light on what was there and what happened. At that time I was around 49 years old, and along with other fellow Chagossians, we decided to create a group to represent us, and we founded The Chagos Refugees Group. I had to think about our logo and I painted one with a basket, a knife and some other tools called piques that we used to remove the skin from the coconuts. And this started the process for me—drawing out the familiarities of our home and the things that we identified with, that made it home. Before that I would paint occasionally, then after the British declaration, I started to paint more earnestly about the life and the history of Chagossians. Painting the logo for the group had made me more aware that my paintings were valuable in that they helped to show the truth, in the absence of any photographic records. When the logo went through the approval process and was made official by the Mauritian prime minister, he asked me what the origins were of the tools and if they came from South Africa. I responded that these tools were used by men and women living on Chagos in their daily work in the coconut fields. It was at that point that I really understood the power and importance of these paintings, of this record. FNND: What process do you go through before starting a painting—for example, is there a research element and do you look at past paintings? Does photography play a role and do you own any photographs of home that you can reference? CS: I do not have any of my own photographs from Chagos, not even of my family—all my paintings are born from my mind. I draw reference more from books that use rich colours, or photos of other places where the colours and subjects remind me of the islands—a seashore with a boat for example. I try my utmost to keep these details in my head. FNND: Memory is selective—particularly perhaps since the invention of photography, which in some ways limits the way we remember the past and also, the way we archive and record truths. Without the influence of photography, memory remains nonetheless selective, creating its own fictions in the process of recalling. The British Government used fiction to hide the truth about the residents of the Chagos islands, and in turn, you are using your imagination, or we could say fiction, combined with the facts to reconfigure and represent truths about life on the island. Perhaps these are influenced by the things you might have been told happened and have since reimagined for example. 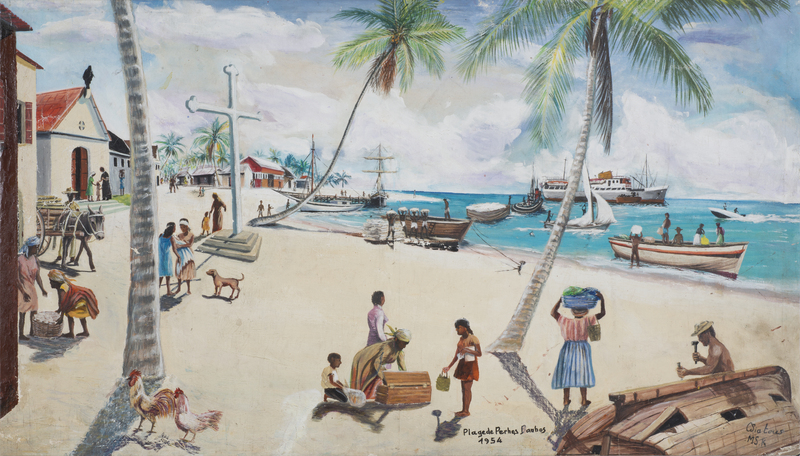 If we take the work Plage de Perhos Banhos, 1954, that was painted in 2012, can you talk me through how you access memory and what triggers you to paint a particular scene, set in a specific year? CS: Yes, each and every painting starts from a specific memory that I have of what life on Chagos was like. As I mentioned, I don’t have any photos to reference. It was only more recently that I saw some images of Chagos. As I remember it, they were in black and white, with no colours. I didn’t use them because colours are very important to me, they represent the mood or essence of the islands. There are anomalies, for example, the painting R barkossion de copra sur la mer dans Diego Garcia originated from a photo I saw on Facebook (social media)—it was an image in black and white of a scene at the dock. But for me the image was incomplete – it did not tell the whole story. 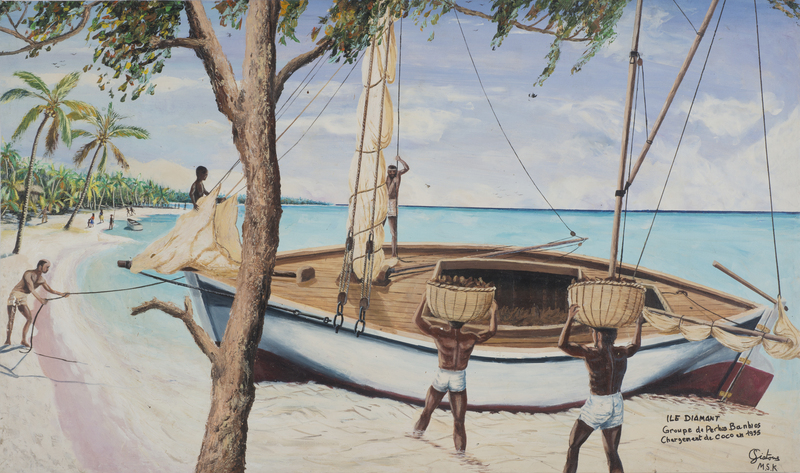 I added some more people, the coconuts, the fish and so on, to give people a sense of the whole history, and then I also painted in the plantation managers completing some of their responsibilities, as this job was guided by managers. I added in the background, a view of Diego Garcia, to show where the boat was, which was not on the original photo, to let people know exactly where on the islands the boat would have been. The original photo had just one man working. The English flag was not so visible in the photo but I painted it clearly because the boat was under the charge of the English government—proof that the island would soon close. FNND: Do you draw from the memories of the community as a whole or do you draw from your own memories only? CS: I place myself within my memories but I also try to capture all our memories, and those of other Chagossians and the details they tell me. It is important when I look at the painting, especially when I see how the people are working, that it reminds me about my island and our lives then. I don’t know if there will ever be Chagossians on the island again or if it will re-open, and we can never have the life which we have lost, but with the pictures I make they cannot be taken from us. That’s why I paint. FNND: Can you tell me a bit more about your plans for the work—is there a particular inventory of scenes that you will paint and why are these scenes important? CS: There are many, many more paintings I plan to complete, more memories and details from Chagos that I want to capture. I have yet to paint all the 32 different jobs which we were responsible for on the islands. I plan one new series, about 15 paintings—the title is Batte la boue pour faire la corde coco—in order to complete the series. This will include more social activities—the sega parties and dancing, the toys we had, and many more, which become clearer and materialise as I paint. Each one of my paintings is a political act, showing my anger to the British Government as they continually stated there was no one living on the islands. We have had many difficulties, some of the community even with regards to their passports. After deportation, any Chagossian who tried to get their birth certificate, stating place of birth, was denied. The Mauritian government had no records of births as they were Chagossian, but as it was now owned by the British, there were no birth certificates to issue. It could have been brought to the courts, but most of us had no money to do this. A large group was deported to the Seychelles, so many went there to try and register. But, there was still no record and so they had to gather testimonials from family. It took a number of years just to claim a record of their birthplace—this denial is a denial of our human rights and this body of work is my contribution to the Chagossian fight. I see these paintings as legal proof that we are from the Chagos Islands. FNND: Your works look like sets to a film perhaps or scenes from an ongoing visual story; there are many pockets of activity and there is always some kind of action or conversation. Can you tell me a bit about that, about perhaps the influence of film or graphic novels? CS: When I was a child, I loved to look at different comic books and also any books I could find about American Hollywood movies. The stories of the wild-west, the cowboys, and the Indians that would fight the Americans. Like Elvis Presley inFlaming Star, The Battle at Apache Pass and John Wayne. I always liked to see how they created the mountains for the sets and I would draw the wooden houses. But I don’t think about film when I paint. I focus on the story that I am trying to show, adding in details until there are several layers of stories occurring, lots of different characters, until the scene is as full as a scene from a film, until it conjures the bustling life on our islands. FNND: You pick very particular times of day, and also specific dates for the pieces—why are these important and what is the relevance of these dates? CS: When I am painting, for example if I am working on a face, I concentrate only on one thing. There are at least 20 steps that I go through, starting at the far end, and working forward through the layers of perspective. For example, with Salamon Bordero pilser coco fam la batin 1945, I set the date as a way of providing more historical context for the viewer. 1945 is before I was born but there were generations before me that had lived on the islands and as these paintings work as a record, I felt it important to push back in time. The paintings have become more and more complex with time. There is a lot more activity and play on light and dark. To provide another stream of historical accuracy, I take into consideration the time the scene would have taken place—for example, if a regular activity would normally happen at noon, the sun should push the shade beneath our feet. The water is also a clue to the time, as it changes depending on where the sun is—from blue, to red, to sparkles of light when the sun is overhead. The shading has become as important as colour, bringing the scenes to life, setting a time and a place that is very specific and undeniable fact. FNND: I guess in this way, they reference film or the documentary photography that you mentioned you used to like growing up. But really, they belong to a more traditional way of recording or archiving—a process or method that pre-dates photography. CS: Yes, one that relies on our imaginations and our ability to re-interpret this into something that can be shared. For me it is a way to tell our story.